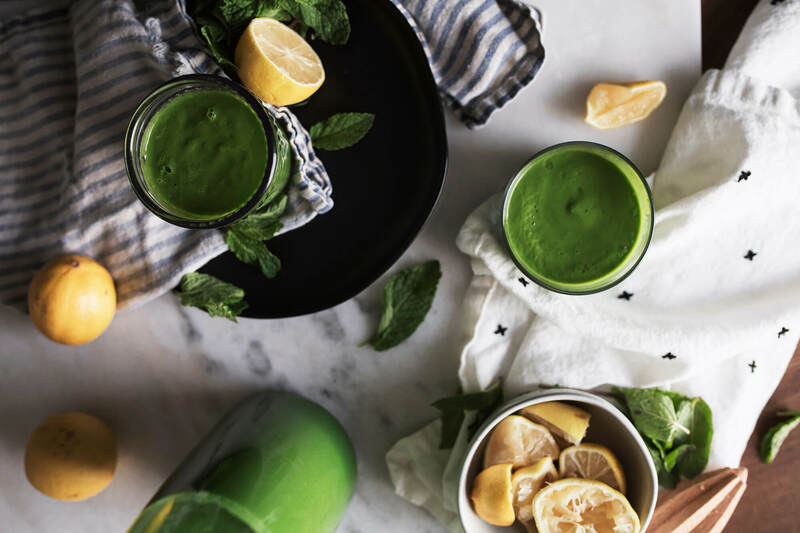 Let’s say you’re in the mood for something indulgent, but you don’t want to destroy your diet. My suggestion? 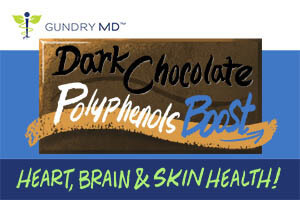 Eat dark chocolate… and if anyone gives you grief, tell them a doctor told you to do it! I’m not kidding. In moderation, dark chocolate is a fantastic addition to your diet. So what makes dark chocolate so potent? 1. It’s a polyphenol powerhouse. RECIPE: When making your morning coffee, add ½ oz of unsweetened chocolate (it’s highest in polyphenols) to your brew. It’ll melt into the coffee for just a pleasant hint of chocolate! 2. It’s great for your cardiovascular system. TIP: Look beyond chocolate bars. Unsweetened cocoa powder has all the benefits of chocolate bars, so make sure to keep some in your pantry – look for non-alkalized “natural” cocoa instead of dutch! 3. It improves your brain function. 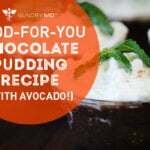 RECIPE: For a simple, heart-healthy chocolate pudding, simply blend ¼ cup of non-dutched cocoa powder with a pinch of salt, a few drops of vanilla extract, an avocado, and a few drops of stevia. You won’t believe how delicious it is! 4. It protects your skin. Remember when you were a teenager and someone told you chocolate would give you zits? Turns out, that’s not true. Chocolate is actually packed with nutrients that protect your skin. Tip: Remember, the key to enjoying chocolate is MODERATION…in fact, a serving size is just 1 ounce. Luckily, when it comes to dark chocolate, a little goes a long way. 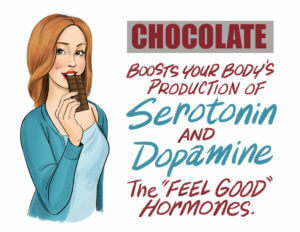 You’ll probably be satisfied with just ½ ounce of chocolate per day! And not just because it tastes good, either. 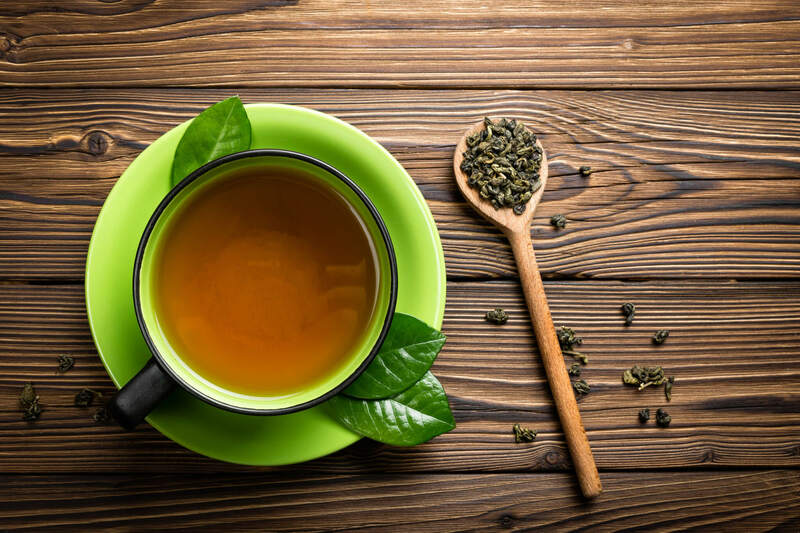 That means it could help you feel calm, relaxed, happy, and even more energized. Recipe: Melt 2 oz dark chocolate in a double boiler or microwave. Mix with ¼ cup chopped hazelnuts and scoop into small “haystacks” on a parchment-lined sheet tray. Chill in freezer until set, then enjoy! Clearly, there’s no reason not to enjoy a special treat… especially if that treat is dark chocolate. But you’ve got to choose wisely. Most chocolate on the market today isn’t great for you at all. In fact, many bars are mostly sugar and milk with as little as 10% actual chocolate! The higher the cacao percentage, the better. Start with 72% and then kick things up to 85% or even 90%! To truly benefit from the power of chocolate, pick a bar that’s at least 72% cacao. The higher the cacao percentage, the better. I encourage you to start with 72% and then kick things up with 85% or even 90% cacao bars. They’re less sweet, but the benefits are incredible. Now, these bittersweet chocolate bars aren’t the candy bars you see in the checkout aisle… but most grocery stores do carry them. 1. In the baking aisle, near the chocolate chips. 2. In the candy aisle, near the high-end candy bars. 3. In the health food aisle! So if you don’t see it right away, ask someone where the dark chocolate is. I’ve never had trouble finding great dark chocolate in the specialty candy section or baking aisle – even in stores like Wal-Mart, Kroger, or Safeway! So, grab some today, and enjoy! P.S. Do you have a favorite way to eat dark chocolate? Comment below and share it with me! I’d love to help adapt it to fit the Gundry MD diet plan. And don’t forget to share this article on social media: look for the “SHARE” buttons at the top and bottom of the page. 1. Aubrey A. A Chocolate Pill? Scientists To Test Whether Cocoa Extract Boosts Health. National Public Radio – The Salt. 2016. Available at: http://www.npr.org/sections/thesalt/2016/08/29/491195004/a-chocolate-pill-scientists-to-test-whether-cocoa-extract-boosts-health. Accessed September 7, 2016. 2.Crozier S, et al. Cacao seeds are a “Super Fruit”: A comparative analysis of various fruit powders and products. Chemistry Central Journal. 2011;5(1):5. doi:10.1186/1752-153x-5-5. 3. 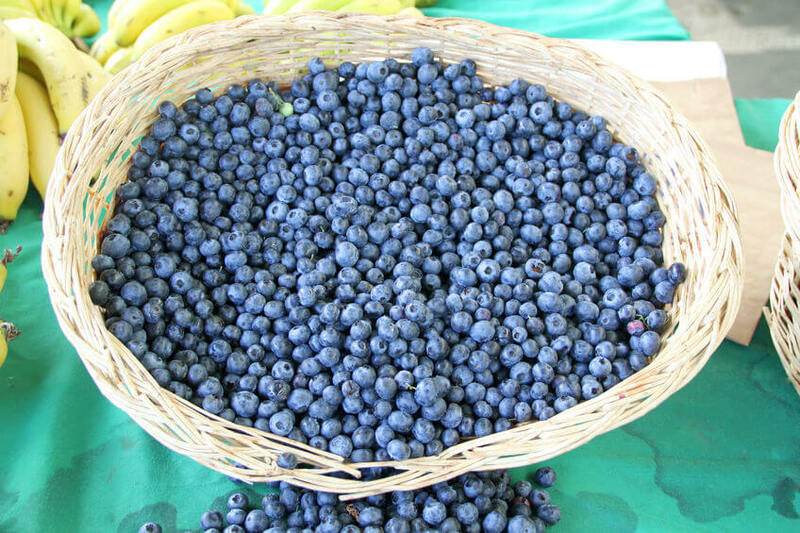 Halliwell B. Antioxidants in Human Health and Disease. Annual Review of Nutrition. 1996;16(1):33-50. doi:10.1146/annurev.nutr.16.1.33. 4. Sathyapalan T, Beckett S, Rigby A, Mellor D, Atkin S. High cocoa polyphenol rich chocolate may reduce the burden of the symptoms in chronic fatigue syndrome. Nutrition Journal. 2010;9(1). doi:10.1186/1475-2891-9-55. 5. Fisher N, Hughes M, Gerhard-Herman M, Hollenberg N. Flavanol-rich cocoa induces nitric-oxide-dependent vasodilation in healthy humans. Journal of Hypertension. 2003;21(12):2281-2286. doi:10.1097/00004872-200312000-00016. 6. Pacher P, Beckman J, Liaudet L. Nitric Oxide and Peroxynitrite in Health and Disease. Physiological Reviews. 2007;87(1):315-424. doi:10.1152/physrev.00029.2006. 7. Taubert D, Roesen R, Lehmann C, Jung N, Schömig E. Effects of Low Habitual Cocoa Intake on Blood Pressure and Bioactive Nitric Oxide. JAMA. 2007;298(1):49. doi:10.1001/jama.298.1.49. >8. Baba S, et al. Plasma LDL and HDL cholesterol and oxidized LDL concentrations are altered in normo- and hypercholesterolemic humans after intake of different levels.. – PubMed – NCBI. Ncbinlmnihgov. 2016. Available at: http://www.ncbi.nlm.nih.gov/pubmed/17513403. Accessed September 7, 2016. 9. Francis S, Head K, Morris P, Macdonald I. The Effect of Flavanol-rich Cocoa on the fMRI Response to a Cognitive Task in Healthy Young People. Journal of Cardiovascular Pharmacology. 2006;47(Supplement 2):S215-S220. doi:10.1097/00005344-200606001-00018. 10. Desideri G, Kwik-Uribe C, Grassi D et al. Benefits in Cognitive Function, Blood Pressure, and Insulin Resistance Through Cocoa Flavanol Consumption in Elderly Subjects With Mild Cognitive Impairment: The Cocoa, Cognition, and Aging (CoCoA) Study. Hypertension. 2012;60(3):794-801. doi:10.1161/hypertensionaha.112.193060. 11. Smit H, Gaffan E, Rogers P. Methylxanthines are the psycho-pharmacologically active constituents of chocolate. Psychopharmacology. 2004;176(3-4):412-419. doi:10.1007/s00213-004-1898-3. 12. Heinrich U, et al. Long-term ingestion of high flavanol cocoa provides photoprotection against UV-induced erythema and improves skin condition in women. – PubMed – NCBI. Ncbinlmnihgov. 2016. Available at: http://www.ncbi.nlm.nih.gov/pubmed/16702322. Accessed September 7, 2016. 13. Macdiarmid J, Hetherington M. Mood modulation by food: An exploration of affect and cravings in ‘chocolate addicts’. British Journal of Clinical Psychology. 1995;34(1):129-138. doi:10.1111/j.2044-8260.1995.tb01445.x. written in such an ideal approach? I have a mission that I am just now working on, and I have been at the look out for such info. I tried the Vital Reds & Primal Plants for the first time and feel immediate results! Looking forward to long term results! My brother has had a couple heart attacks. Followed by operations to open his arteries. The last heart attack was a death experience. The Doctors worked desperately to bring him back to life! His recovery has been long and hard. Everyone including himself feel he is on final days on this earth! Is it too late for him to start using Vital Reds, Primal Plants etc…? I like to mix my chocolate powder with coconut oil and vanilla, sometimes nuts , and put in fridge. But I really have to try the avocado in place of coconut oil!